I was originally thinking about making veggie burgers when I was making this recipe. As a gluten-free vegan, my burgers are usually bunless, which is kind of lame. I thought it would be better to make something that didn’t require a bun instead, and these fit the bill! These have a variety of Indian spices, cashews, white beans and a few other things thrown in. They get a bit of crunch (and flavour) from being rolled in coconut before being baked (lower fat, yay!). Preheat oven to 350 degrees. 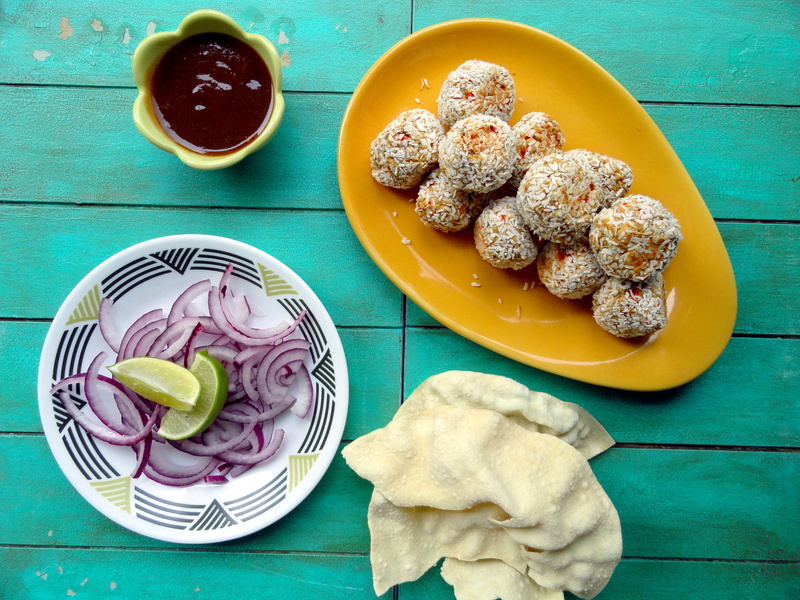 Add ingredients one at a time in a food processor, except for the coconut. Run the food processor for a bit after each ingredient is added. I mince my garlic directly in the food processor, and it also finely chops my onions as well. When you get to the cashews, try to process them so there are still pieces left for texture. 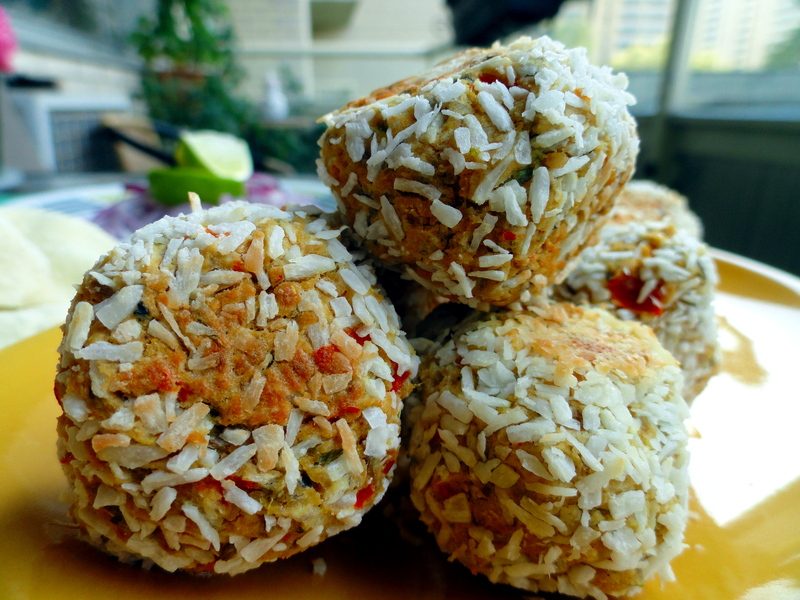 Once everything is blended, take heaping tablespoons (falafel sized) of the mixture, form it into balls and roll it into coconut. Place the balls on a lightly greased piece of parchment paper on a baking sheet. Bake for 30 minutes, turning them halfway through. Check after 20 minutes to see if they are done. Soak the tamarind in the boiling water for 15 -25 minutes. Using a fine meshed sieve, press the tamarind through into a bowl (This gets rid of all the fiber bits). In a heavy pot, toast the cumin and chili flakes. Grind the cumin and chili flakes and put them back in the pot. Add the tamarind juice, amchur, sugar and salt and cook on medium until heated through. If the mixture is too thin for you, cook longer until desired consistency is reached. I like a thinner sauce, so I add some water to thin it out. I served mine with some thinly sliced onions and lime wedges, and some freshly made (microwaved) poppadoms.